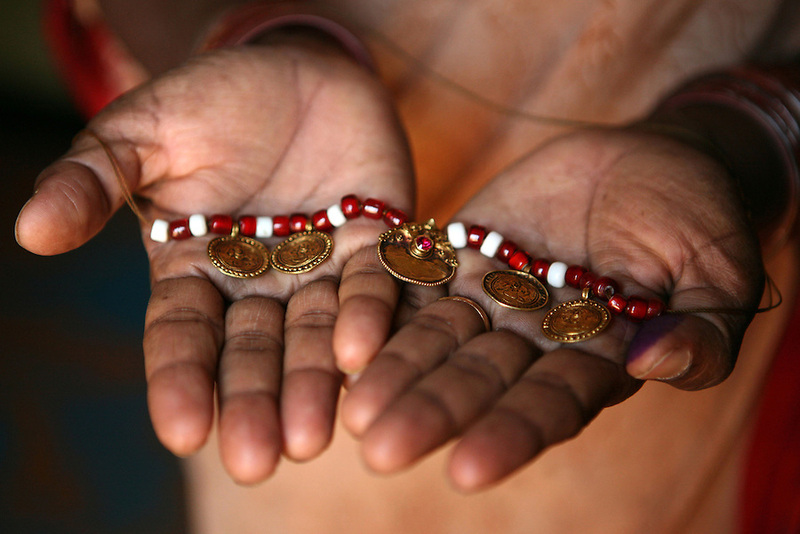 Vimala Madar, 40, holds her "muttu", the red and white beaded necklace tied around her neck during the dedication ceremony performed on her when she was ten years old to convert her into a Devadasi. During this ceremony, Madar was "married" to the Hindu deity, Yellamma, and was then considered one of Yellamma's servants. From this day on, she was no longer eligible to marry a mortal and had to perform temple duties as well as fulfill the sexual needs of the priests and men in her community. Madar's mother too was a Devadasi and tradition has it that any girl child of a Devadasi too must become a Devadasi, ensuring a constantly replenished supply of new young Devadasis.